Antonia Aquilante’s new novel is published today by Dreamspinner Press. I’m delighted to support the launch – read an excerpt here! Savarin glanced over as Loriot stepped up beside Lord Etan’s chair. The captain looked his usual competent self this afternoon; Savarin hadn’t seen him look less than competent in all of their association. His thick, dark hair all in place, short beard neatly trimmed, deep red and brown uniform perfectly pressed. The royal seal was embroidered on its breast, his captain’s insignia displayed on the jacket’s arm. “There have been reports of bandits in the area, perhaps crossing the border in and out of Amaranta,” Prince Philip said with an inquiring glance at Loriot. “Yes, Your Highness. There are, of course, patrols out looking for them,” Loriot said, supplying the requested information. 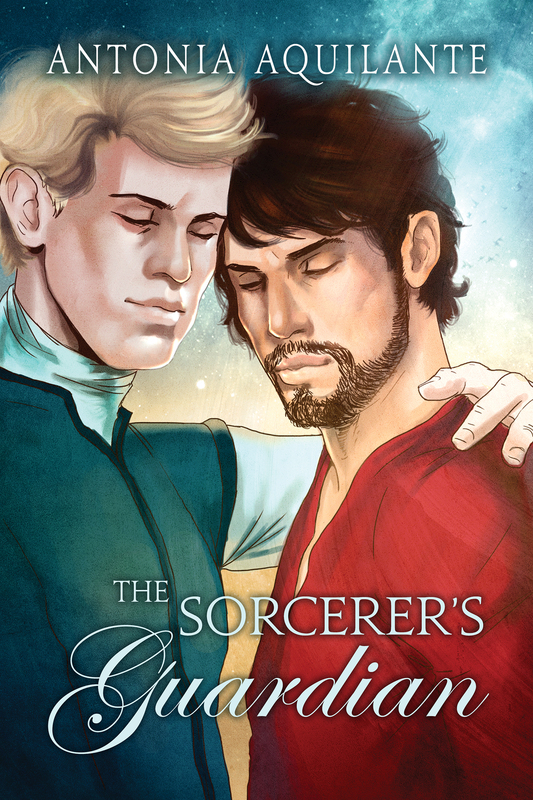 “I need not remind you that I’m a powerful sorcerer, Your Highness. I can take care of myself,” Savarin said through gritted teeth. He didn’t need a nursemaid or a protector. Savarin wanted to argue. He didn’t want anyone with him on this trip; he preferred to work alone, to travel alone. He didn’t need anyone with him, especially not for protection. But he also recognized the futility of arguing with Prince Philip at this point. He probably shouldn’t argue with Prince Philip at any time, but sometimes a discussion was warranted. “I do not need several guards.” Savarin couldn’t resist saying it, though Loriot was the only one who spared him a look. And that was plainly a dismissal. Savarin was going to have company on his travels whether he liked it or not. Previous Passing Shadows – Cover Reveal and Publication Date! Thanks for hosting me today, Anna! You’re very welcome, Antonia. Every best wish for the book.